Vizio is rapidly catching up with all the elites with its amazing 2017 TV lineups. The M-series is surely among some of the best selling TVs in this year. This is no wonder since it is offered at a relatively pretty low price in comparison to most 70’’ UHD TVs in the market. VIZIO M70-C3 allows you to watch TV shows, sports, and movies in amazing detail with its bold, big 70-inch Ultra HD screen. 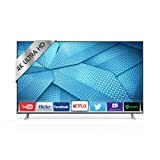 Also, everyone looking for a TV with great smart features should consider this model since Vizio Internet Apps Plus ensures access to a vast array of well-known streaming services that include 4K content and Internet radio. Performance of this TV is really outstanding, especially if you take its price in consideration. 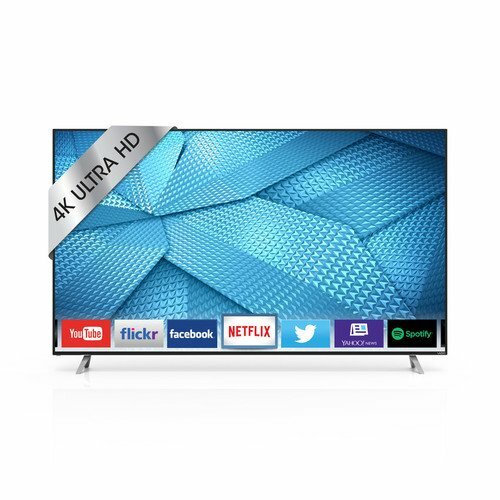 So, if you are in the market for a huge screen Ultra HD TV with amazing performance, you should definitely take a look at this model from Vizio. This really handsome display is definitely one of the most attractive display panels from Vizio. The screen on this TV contains a semi-mate finish that is surrounded by a black slim bezel, which is accented with a really thin gray trim. The depth of this TV set measures approximately 1.61 inches. The bezel is a little thicker along the display’s bottom edge. Vizio’s new M-series feature a different stand design – A-frame aluminum metallic corner feet. This design is really nice and it gives the TV set a really elegant appearance. The picture quality of this TV is delightful. You can notice right away how natural and clean the images appear. Colors are very accurate and well balanced, with the perfect amount of saturation. Furthermore, it is amazing how great this display produces skin tones that are rendered with great tonal accuracy. Also, contrast performance is pretty amazing delivering dark/deep black levels with great shadow detail, and peak whites without noticeable blooming. Picture (black) uniformity is awesome on this TV set with no visible clouding, hot spotting or light bleed. Optimal picture performance on VIZIO M70-C3 would probably be achieved utilizing the Calibrated picture mode. The only downside to this display’s picture performance would be the pretty apparent side angle picture image dimming-it starts to dim noticeably at about 20 degrees. For a pretty affordable 4K TV, the Smart features offered by the VIZIO M70-C3 are quite a treat. It is powered by a V6 six-core processing unit with a pretty wide 4K UHD video streaming support for Netflix, UltraFlix, Amazon, and others. Also, you will find that Vizio’s Internet Apps Plus is extremely helpful when you manage online content for your television and browse the web.